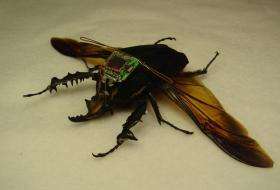 (PhysOrg.com) -- A team of scientists funded by the US Defense Advanced Research Projects Agency (DARPA) have implanted miniature neural and muscle stimulation systems into beetles to enable their flight to be remotely controlled. 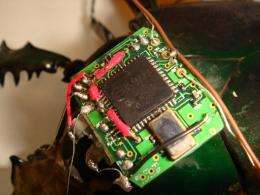 Researchers Hirotaka Sato, Michel Maharbiz, and colleagues implanted a system of nerve and muscle stimulators, a microbattery, and a microcontroller with transceiver into beetles. They were able to successfully control the beetles' take off, flight, and landing by stimulating the brain to work the wings. They controlled turns through stimulating the basilar muscles on one side or the other to make the wings on that side flap harder. Three types of large beetles from Cameroon were used in the experiments, which were carried out at the University of California in Berkeley. The smallest, cotinis texana, is 2 cm long, while the largest is a massive 20 cm long (megasoma elephas). The third species was mecynorhina torquata, a 7 cm long beetle. The components of the system were implanted in the beetles when they were at the pupal stage. 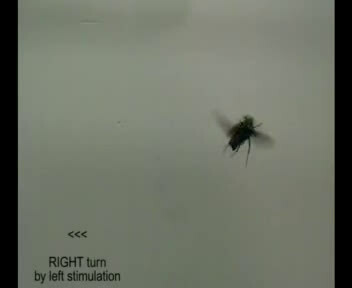 According to Professor Noel Sharkey, an international expert on artificial intelligence and robotics from Sheffield University in the UK, there have been attempts in the past to control insects such as cockroaches, but this is the first time the flight of insects has been controlled remotely. The ultimate military application of remotely controlled beetles is puzzling, Professor Sharkey said, since you would need to also implant a GPS transmitter/receiver to pinpoint the beetle's location, and probably a camera too, but this would be too heavy for even the largest beetle. Potential use of the system as a means of carrying a payload of biological or chemical weapons would be completely illegal. The Berkeley researchers suggested the "cyborg" beetles -- part beetle, part machine -- could serve as models for micro air vehicles. DARPA, which funded the research, is also known to be developing a Nano Air Vehicle (NAV) that would weigh less than 10 g, and measure under 7.5 cm, and give the military the capability of carrying out indoor and outdoor operations in urban warfare situations. Sato and colleagues also said the beetles could serve as couriers to inaccessible locations. The Berkeley team is also experimenting on dragonflies, flies and moths because of their "unmatched flight capabilities". Scary somehow. I wonder when the US will start implanting their soldiers (or the general populace) with stuff like this. This seems limited in usefulness, but nevertheless is still pretty terrifying. @antialias: I wouldn't worry about the government implanting anything like this in you any time soon. At most you would get a strong urge to turn in circles every now and then. Plus you'd probably notice the whole "invasive surgery" and "circuit board sticking out of your face" part. Potential use of the system as a means of carrying a payload of biological or chemical weapons would be completely illegal. Reminds me of when they said torture and waterboarding was illegal, but did it anyway. Me too. Limited use? Everything is getting smaller at an accelerating pace these days. I wouldn't be surprised if we had a camera and GPS shrunk onto a light and small chip soon. Or use the camera with visual cues (lasers of different colors) to fix position. I can't believe how unethical this is. Watch the first video, and try to imagine that is yourself. It is terrible. Make robotic beetles, cut out the middleman. And no harm is done. 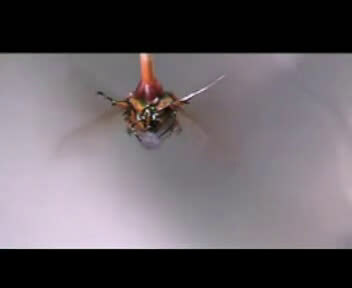 Right, one beetle would carry the GPS, another the camera, while the rest of the swarm carried the contaminant. A nice, compact army... intriguing. When can we have epic mind control wars where we can hack the other armys troops. They can miniaturize GPS and put it into them. If you took the GPS integrated circuit out of the plastic "can" you'd get something like a sliver of paper that can be pasted to a beetle's back. Sci fi told us these were coming. 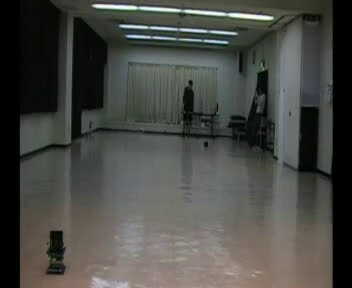 It won't be long until mini-spy robot bugs have you tube worthy videos of famous people doing private things. Paparazzi bugs! Remember the remote controlled cockroach in the Fifth Element? It had a camera and mic strapped to it. where can I get one of these rigs for controlling my minions? This is something our world is screaming for. How have we done so long as a civilization without this? It is crude, useless, mindless and indicative of an infantile culture. No less than sick. Ethics don't come into it. The evolution hase no limits these days. Many ethical questions are rising. For the devoloping of robots is waiting the same destiny. How far must we go in devoloping smart machines or manupilating animals with electronics??? Well they are mapping our minds right now and tunnelin nano bots can easily be a grain of sand in a sandwich. I would voluteer if they gave me control of my daily routine so I would excercise more :-D. Besides I would also want the memory upgrades and cognitive enhancements for scientific research. If I had the library of congress in my head I bet I could invent just a bout anything and everything. I have a few very good ideas now. My problem is that I am business illiterate. This might be where this scripture applies:Re 9:3 And there came out of the smoke locusts upon the earth: and unto them was given power, as the scorpions of the earth have power. Re 9:4 And it was commanded them that they should not hurt the grass of the earth, neither any green thing, neither any tree; but only those men which have not the seal of God in their foreheads. Re 9:5 And to them it was given that they should not kill them, but that they should be tormented five months: and their torment was as the torment of a scorpion, when he striketh a man. Re 9:6 And in those days shall men seek death, and shall not find it; and shall desire to die, and death shall flee from them. Re 9:7 And the shapes of the locusts were like unto horses prepared unto battle; and on their heads were as it were crowns like gold, and their faces were as the faces of men. Re 9:8 And they had hair as the hair of women, and their teeth were as the teeth of lions. It is elegant, sophisticated, inspired, useful, and indicative of a pragmatic, maturing culture. Sick is a moral judgment- you know, good or bad? Right or wrong? This is both brilliant and inevitable. To let someone else do it first would be... bad, wrong. It's a bug goddamit. And we are merely the bug that will destroy all other bugs. I am in no conceivable way a 'human-hater', and it is not even so much that I 'love animals'. I merely think that human knowledge is paltry, and there is a vast amount of knowledge that we can't comprehend, especially concerning animals. What gives us the right to lord over them? We 'think' we are above nature, when realistically we are part of nature itself. This would be a best selling toy. Build your own remote controlled beetle! It's time to reinvent the bug-swatter. "Potential use of the system as a means of carrying a payload of biological or chemical weapons would be completely illegal." Yeah, cause our government is ALL about following it's own rules. Beetle not included. I can just picture pranksters with hordes of remote controlled tarantuals having a blast on Halloween. At the end of WWII, it was said that for each year of 'civilian' science that passed by..that the US government's (what then become the 'black ops') secretive and controlled military technological skunkworks was ahead of said civilian works by a rate of 50 years. This speed of advancement in black ops - per 'regular' year ....is the point. Recently, this 'speed differential' of black ops technological advancement was knocked back to 44 years per 'normal' year. This means that the sort of technology seen here with this beetle in 'public' civilian based science is likely 25-30 years (civilian/public years) behind the level of sophistication of neurological work in buried and hidden advanced technology. "I've .. seen things you people wouldn't believe. Attack beetles on fire off the shoulder of Orion..."